A while back I received an email from a Discover Circuits visitor. He wanted to know how he could use a single 12v solar panel to charge a 24v lead acid battery bank. He said he used the 24v battery to run an emergency 120vac power system. By using the higher 24 volts instead of 12v, his DC to AC inverter could pump out more peak power, for starting things like well pumps and window air conditioners. I thought about the challenge and came up with a simple solution. 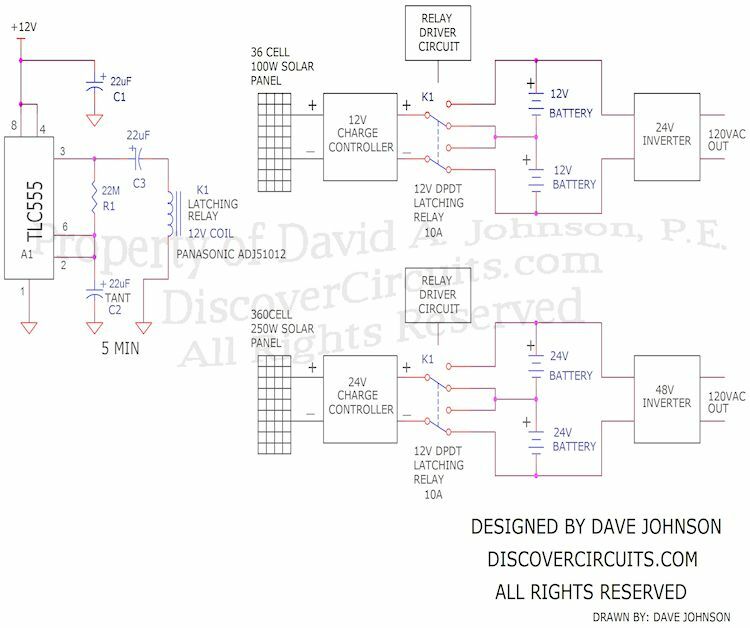 The charging circuit shown below takes advantage of very common 12v battery charge controllers, connected to a high current double pole/double throw (DPDT) latching relay. The 12v latching relay is the type which uses a single coil. A simple 555 timer, wired as a low frequency oscillator, drives the single coil relay with short pulses, which applies alternating polarity pulses to the relay’s coil every 5 minutes. The oscillator first sets the relay, which charges one 12v battery, then switches the charger to the second 12v battery. You own an emergency solar power system. It consists of two 100w 36 cell solar panels wired in series, connected to a charge controller. You lose one solar panel. How do you charge the 24v battery from a 12v source? Another configuration could use a 60 cell solar panel, designed for charging 24v batteries, to charge two different 24v batteries. This would boost the voltage to 48v.